Everyone experiences anxiety at some point; life is full of events that cause fear, anger, or dread, and reacting to those events with anxiety and trepidation is natural. While ordinary anxiety is normal, the extreme anxiety experienced by those with Anxiety Disorder is not. There are several types of anxiety disorders. While each disorder ranges from mild to severe in nature, the one thing they all share in common is that they all include the quality of extreme, irrational fear that can cripple a patient’s relationships and lifestyle. It is important to know that regardless of the cause or type of disorder an individual has, anxiety treatment options are available. Antidepressants are the most common types of treatment for Anxiety Disorders. These medications address the chemical imbalance of neurotransmitters in the brain by increasing brain cell communication. Examples include Prozac, Zoloft, Lexapro, and Paxil. Anti-anxiety drugs are generally used to treat short-term symptoms of Anxiety Disorder due to their addictive properties. Drugs such as Xanax, Klonopin, and Valium can help relax muscle tension and other physical Anxiety Disorder symptoms. Beta blockers such as Inderal can also decrease the physical symptoms of Anxiety Disorder and can help patients deal with potentially scary social and familial situations. Those who blush, tremble, or shake during social interaction may find beta-blockers beneficial. Psychodynamic Therapy involves uncovering suppressed, unconscious memories or impressions of events or thoughts that are causing Anxiety Disorder. Particularly useful for those whose problems stem from traumatic events, this type of therapy will help heal those whose problems stem from aspects of these events that they cannot remember. Cognitive Behavior Therapy helps Anxiety Disorder patients change their negative, irrational thought and behavior patterns into normal, healthy patterns. Patients utilize exposure techniques that help them deal with their fears, potentially leading to a reduction in Anxiety Disorder symptoms. Hypnotherapy is a technique that allows therapists to bring a patient into a trance of heightened awareness in which the patient may be able to relive painful events and recall details that are inaccessible in the normal conscious state. Therapists may also be able to suggest that patients stop certain behaviors while under hypnosis, curing them of bad habits or negative thought processes. St. John’s Wort has long been associated with relieving the effects of depression and anxiety, and some studies have shown it to be effective in reducing minor depression symptoms. Other scientists, however, warn that no study has found St. John’s Wort to be an effective treatment for severe depression and anxiety and that the herb negatively interferes with many antidepressants. SAMe is a synthetic form of a naturally-occurring compound that has shown promise in some studies of reducing anxiety symptoms. While it is not approved by the FDA, it is approved for depression treatment in Europe. As with all such remedies, patients should consult with physicians before taking SAMe. Omega-3 Fatty Acids are found in cold-water fish, flaxseed, and walnuts and help with a number of illnesses and disorders, including anxiety. While not recommended as an official treatment by professionals, taking fish oil pills or eating a diet rich in Omega-3 fatty acids may help relieve Anxiety Disorder symptoms. Relaxation Therapy involves using some sort of relaxation technique such as yoga, meditation, or prayer. Patients usually focus on a concept or idea and attempt to clear their minds of troublesome thoughts. While none of these things will cure Anxiety Disorder, they can help reduce anxiety and increase calmness and focus. Experts estimate that over 40 million American adults suffer from some sort of Anxiety Disorder but that only about 30 percent of them will receive treatment for their disorder. Anxiety Disorder also affects one in eight children, and elderly Anxiety Disorder rates are similar. Untreated Anxiety Disorders can lead to poor school or job performance, missed social opportunities, and substance abuse. Experiencing a childhood trauma can increase the chances of contracting Anxiety Disorder. Suffering through stressful situations or chronic illnesses can increase the risk of Anxiety Disorder. Females contract an Anxiety Disorder twice as often as men. 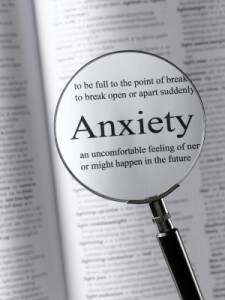 People with family members with Anxiety Disorder may eventually contract an Anxiety Disorder as well. Caffeine and nicotine can increase anxiety and thus exacerbate Anxiety Disorder. Nightmares, difficulty sleeping, and an inability to remain calm are symptoms of Anxiety Disorder. Feelings of panic, terror, and agitation may be signs of Anxiety Disorder. Cold, sweaty hands, difficulty breathing, and palpitations are signs of Anxiety Disorder. Dry mouth, nausea, and dizziness my indicate Anxiety Disorder. Traumatic flashbacks and repeated ritualistic behaviors are possible indicators or Anxiety Disorder. General Anxiety Disorder is characterized by a general irrational fear that everything in life is going to go wrong. Sufferers of GAD are so paralyzed and crippled by fear and anxiety that they have difficulty interacting normally at work, home, or in social situations. Obsessive Compulsive Disorder causes those who have this problem to fixate on certain thoughts or activities that develop into repeated rituals. While the rituals themselves may be innocuous, the drive to perform them repeatedly often leads to a disruption of the individual’s personal and professional life. Panic Disorder occurs when a fierce, sudden panic strikes a person and triggers a panic attack. These panic attacks produce fear, chest pains, and difficulty breathing, so patients often suffer just as much from dreading the next panic attack as they do from experiencing one. Post Traumatic Stress Disorder is often the result of combat or another traumatic occurrence and involves intense feelings of fear, anxiety, and guilt. People suffering from PTSD may have flashbacks of the traumatic event, may avoid other people, and may show excessive emotions of one type or another. Phobias are intense and irrational fears of specific objects or ideas that exceed normal, understandable fear. There are multiple categories of phobias, ranging from fear of a certain animal to fear of a certain element or environment. Social Anxiety Disorder involves an irrational and overwhelming fear that participating in a social situation will result in judgment, awkwardness, and ridicule. People with this disorder often have overly negative opinions of themselves and generally avoid social situations for fear of committing a terrible faux pas. Since Anxiety Disorder is the most common form of American mental disorder, nobody should avoid treatment out of shame or embarrassment. Those who believe themselves to have Anxiety Disorder should consult a physician as quickly as possible in order to begin one or a combination of anxiety treatment options.